For the past few months, British celebrity chef Simon Rogan has commuted back and forth between the UK and Hong Kong, running his esteemed restaurants back home while opening Aulis, his experimental kitchen, and Roganic, the follow-up to his celebrated hotspot in London’s Marylebone. Unlike Aulis, a testing ground for newly created dishes set to be tested, Roganic’s offerings are often the fruits of the creative development process and fine polishing. Passing the secluded quarters of Aulis beside the main entrance, Roganic resides at the centre of the sizable restaurant space. Surrounded by wooden tones with shelves of potted greens and flora, the establishment stays true to its plant-centric theme with moss and twigs lining the ceiling while brass light fixtures warmly light up the earth-toned space. Tables are evenly spaced across the room with much privacy for the guests, allowing each diner to enjoy the dining experience with a visual reminder of being in a forest, also coherent with the theme of the restaurant. Serving two tasting menus without a la carte options, Roganic offers an eight-course short tasting menu and a full ten-course fuller one. Guests can also choose between a five-glass wine pairing or a soft pairing featuring cold-press juices and teas as an alternative. We began with the full ten-course menu, featuring four snacks to start, followed by starters, mains, desserts and petit-fours. We began with snacks—dainty marigold-hued tartlets of pumpkin and silvers of crisp nashi pear as fillings, lightened with the herbaceous laurel bay leaf, a beloved prelude to a wonderful bowlful of pea mousse, with mint and sweet peas. The classic combination of cooling mint and spring’s top harvest of petit pois, each bearing juicy sweetness while contrasting with the creamy mousse. A duo of earthy snacks followed: thin wafers topped with fermented mushroom puree and yeast powder, the latter adding a surprisingly tang to the earthy puree, complementing the warm cube of truffle bread-and-butter pudding, a savoury counterpart of the British classic dessert. Sea urchin custard with caviar departed from the vegetable-centric menu, where a delightful tang lightened the savoury custard, while a warm crispy morsel with an exterior coated with squid ink tapioca crumbs, and filled with chicken confit, was freshly fried and warm with a melting dab of mustard emulsion. We love the contrast in temperature between the cool custard and the warm chicken—however, the crispy morsel was a tad too oily to our taste. The bread course arrived after the snacks. Resting on a bed of oats were stubs of soda bread, served warm with soft butter. The malted sweetness was mild but impressive, while the interior was light and ethereal, as a smear of butter gently melted, contributing a savoury touch to the slightly-sweet bread. Roganic’s beef tartare saw Welsh sirloin of beef, hand-chopped and accompanied with oyster emulsion and salted capers. The harmonious pairing of land and sea was refreshing, while a grilled salad of cauliflower, kale, and endives was beautifully simple. Caramelised on the edges while retaining their natural sweetness, flash-grilling kept the freshness of these greens, while truffle custard sauce and molten Westcombe cheese lent a savoury note to the warm salad. Codfish with broccoli and roast bone was a highlight of the evening. A hearty portion of cod broke into juicy flakes, accompanied by spinach puree and chopped brocollini, was an example of simplicity, as hours of cooking went into an intense sauce that complemented the broccolini’s light bitterness that cut the richness of the fish. The same amount of slow cooking went into the jus of duck with turnip and spiced red vinegar, where hours went into reducing a meaty glaze with just the right balance of tartness from vinegar, contrasting against the richness of the 14-day-aged Chinese duck breast, roasted until crispy on the outside and succulent within. Roganic continued its streak of clean flavours in its sweet endings. An earthy but refreshing sorbet of yellow beetroot, drizzled with a homemade mint oil and butter milk dressing, was a perfect play on tartness, as the sweetness of beetroot played up the tang from buttermilk, while muting the dairy’s richness. A show-stopping caramelised apple was Rogan’s rendition of the French tarte tatin. Gossamer-thin ribbons of red apple were curled into a thick circular slab, adorning atop a flaky butter pastry, served with crumble and a botanical-rich juniper ice cream—the epitome of produce-centric cooking driven by the season. While Roganic’s wine selection is impressive with a generous coverage of old and new world with a focus on natural wines, the soft pairing of juices and teas remains a popular choice for its dinner tasting menu. Designed specially to accompany dishes featured in the tasting menus, each paired juice blends are well thought out and cold-pressed to preserve the ingredients’ nutritional value, colour, and freshness. A surprisingly light elderflower mocktail accompanied the warm salad was a wonderful pairing, as the grown-up version of elderflower presse was just sweet enough with a light twist of lemon. A pumpkin-passionfruit juice delivered many surprises, as the sweet pumpkin was steamed and blended with zingy passionfruit, adding a sweet-and-sour accompaniment to the simple apple tatin. Service is remarkable at Roganic, as the service staff is friendly and attentive, with the keenness to assist without overwhelming the guests. Each dish was thoroughly described with occasionally light-hearted humour without losing focus for guests to note the highlights of each dish. It took a little over two hours to complete the full-tasting-menu dining experience, and guests were not rushed despite dishes being served at a good pace throughout the experience. A tasting experience at Roganic mirrors that of an exciting roller-coaster ride, where dishes are impressive with surprises along the way. It takes solid execution and excellent time management in the kitchen to master such delicate delivery with finesse and ease. 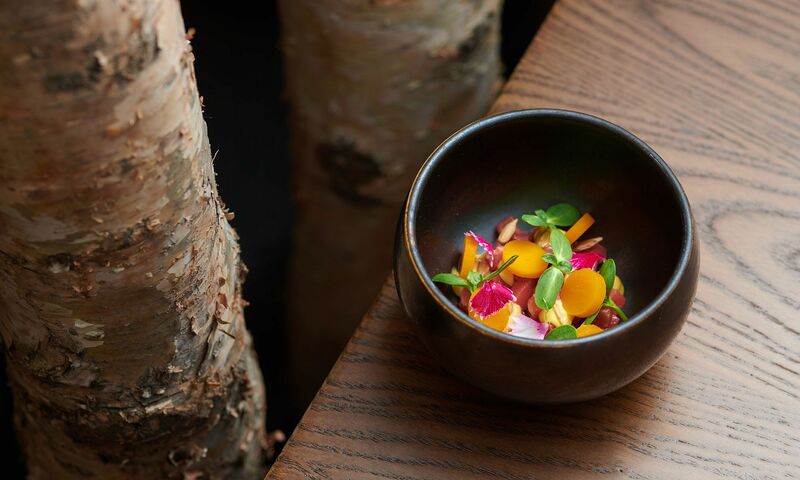 Simon Rogan is a master of this craft, and Roganic proves that to be true.